ZurumNewsdigest. 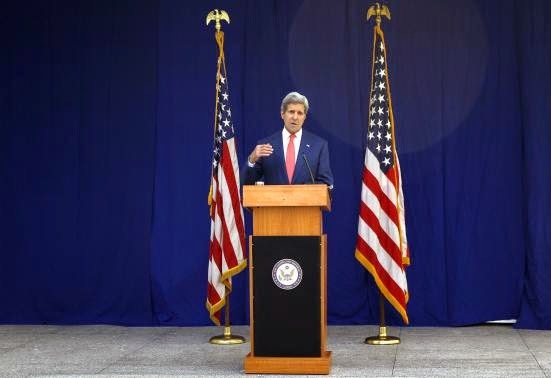 : Full text of Secretary Kerry's Remarks On Nigeria Trip. Full text of Secretary Kerry's Remarks On Nigeria Trip.
. And I was just admiring the extraordinary view and this wonderful location. I’m particularly pleased to be here at this particular moment, just a few weeks before one of the most important elections that this country has held. And this will be the largest democratic election on the continent. Given the stakes, it’s absolutely critical that these elections be conducted peacefully, that they are credible, transparent, accountable, so that the people of Nigeria can have faith and the world can have faith in the government that flows from it. So I came here today to deliver a very simple message, and I met with both major candidates in order to underscore that the international community is paying very close attention to this election and that the international community is deeply committed to working with Nigerians going forward with the hopes that they will have an election that is free of violence and capable of instilling confidence in the future. I was at the World Economic Forum in Davos earlier this weekend where I delivered a speech about the need for a long-term, comprehensive global effort to combat violent extremism, and to address the underlying causes before that extremism takes root. The unfortunate truth is that Nigerians know as well as anyone how desperately that kind of effort is needed. Day after day, the group that calls itself Boko Haram continues to kill scores of innocent civilians and attack villages and military installations in places like Borno, Yobe, and Adamawa states. The United States condemns these attacks which have escalated in recent weeks. And we extend our deepest condolences to the thousands of families that have been impacted, and we deeply regret the toll that this violence has taken on the Nigerian people. We will absolutelycontinue to support the Nigerian military in its fight against Boko Haram. And as I said in Davos, all of us must work together to advance a strategy that will not only stop groups like Boko Haram, Daesh, and al-Qaida, but that will address the environment from which these groups emerge. We were very happy to see the Government of Niger host a regional security ministerial meeting last week to discuss how to better coordinate counterterrorism efforts. This is exactly the kind of thing that I suggested is necessary in the comments that I made a couple of days ago. It is very important that the world cooperate more in helping countries where they want to and where they don’t the full capacity to be able to step up and take on lawless terrorist entities. That is precisely why President Obama has announced that next month in Washington we will host an international summit on combatting violent extremism around the world. It will be held at the WH and at the State Department, it will be at the ministerial, and we hope to bring people together who have been engaged in these fights against the Boko Harams and other entities so we can share best practices, so that we could hear from people about what they need and what they think is necessary in order to be able to summon an even stronger global response. The fact is that one of the best ways to fight back against Boko Haram and similar groups is by protecting the peaceful, credible, and transparent elections that are essential to any thriving democracy, and certainly, essential to the largest democracy in Africa. It’s imperative that these elections happen on time as scheduled, and that they are an improvement over past elections, and they need to set a new standard for this democracy. That means that Nigerians have to not only reject violence but they have to actually promote peace. I met with President Jonathan earlier today and separately with General Buhari, and I was encouraged to hear once again from both men that this is exactly what they intend to do to try to press for an election that can be held with the credibility the people of Nigeria want and deserve. As President Jonathan said in his New Year’s message, none of our political ambitions is worth the blood of any of our countrymen, women, and children. And as General Buhari recently tweeted, electoral violence is unacceptable, and every Nigerian life is sacred. Both candidates have also signed on to the so-called Abuja Accord, which commits them to running exclusively issue-based campaigns, refraining from violence before and during and after election day, and speaking out against any violence that does emerge. These are commitments that we need to see from everyone and they are commitments that need to be kept. Many people are stepping up. For example, Chairman Jega and the thousands of independent national election commission employees are taking concrete steps in order to guarantee that this election is successful. We also urge all of Nigeria’s governors to call for peaceful democratic engagement among their residents, and we ask all parties and all candidates to do the same. And I would say to everybody that no matter what the outcome, if you have a question, if you have a doubt, if there is someplace where issues may have arisen, it is absolutely vital that whatever differences may exist be resolved through legitimate channels, through the legal channels, which are fundamental to the democratic process. And I urge all of Nigeria’s candidates to do what is best for their country no matter the outcome on election day. I want to emphasize that for the United States, Nigeria is an increasingly important strategic partner. Nigeria has a critical role to play in the security and prosperity of this continent and beyond. We are committed to helping the electoral process succeed, and last week we sent an electoral security advisor in order to support INEC’s efforts to advise on security concerns and to help develop a risk mapping tool to prepare for any violence that might emerge. So let me be clear: Anyone who participates in, plans, or calls for widespread or systematic violence against the civilian population must be held accountable, including by ineligibility for an American visa. Violence has no place in democratic elections, and I can guarantee you that the perpetrators of such violence would not be welcome in the United States of America. Nigeria is Africa’s most populous nation and one of the world’s largest democracies. It is blessed with some of the planet’s most valuable and abundant natural resources. Conducting accountable, credible, peaceful elections will help put the Nigerian people on a path to prosperity and regional leadership that is needed in order to address a wide range of challenges in this part of the world, including, obviously, violent extremism. With this election, Nigeria has an opportunity to put an indelible stamp on the kind of future that Africa wants to see and most importantly that Nigeria wants and deserves. I want to reiterate what President Obama recently said, that he, I, and the American people stand with you as Nigeria’s great democratic exercise unfolds. And we stand ready to work with the Government of Nigeria, the Nigerian people, and whomever they elect next month continue – to continue building on the important partnership that we share. And with that, I would be delighted to take a couple of questions. MODERATOR: Our first question comes from (inaudible). QUESTION: Could you give us a bit more of a response to these attacks by Boko Haram in northeastern Nigeria and how concerned you are about this (inaudible)? QUESTION: And can you also give us a bit more of a sense of what concrete steps the U.S. is prepared to take with the Nigeria to fight Boko Haram? Because it has been a concern within the Pentagon about the capability or the commitment of the military to fight Boko Haram. And finally, could you give us sense from here that Boko Haram’s kind of spreading to other parts of Africa and aligning (inaudible) the Islamic State or other terrorist groups? SECRETARY KERRY: Well, let me take the last part of your question first. There’s no specific declaration by Boko Haram of an affiliation with Daesh, but there is evidence that Daesh is making an effort to spread its tentacles throughout a number of countries in the northern part of Africa, and it is obviously a concern that they may try more aggressively to try to spread to countries in the center and southern and other parts of Africa. The United States is deeply engaged with Nigeria. And I’ve seen the articles that refer to some of the problems with respect to that engagement. Everybody’s heard certain criticisms that have been made. Some of them are just flat-out inaccurate. For instance, we do continue to share intelligence with the Nigerian military and intelligence folks. We do cooperate in many ways. We don’t believe that the level of support provided by the United States or the international community is the limiting factor in the Nigerian Government’s ability to fight Boko Haram. And with respect to the military assistance that we’re delivering, we are currently helping the Nigerian – helping Nigeria to increase the capability of its military; to improve its counter-incident explosive detection and civil-military operations capacity; and to carry out responsible counterterrorism operations. Now, does it always well as work – work as well as we would like or as well as the Nigerians would like? The answer is no. There are developmental issues in that relationship and in those efforts. But the United States maintains a very significant level of military cooperation with various elements of the Nigerian security forces. And we’re also providing law enforcement assistance, including by training Nigerian law enforcement officials on counterterrorism investigations and post-blast investigations and crisis management. Right now, we have a team of Nigerian Government crisis management officials in the United States who are participating in a senior crisis management exercise. We have provided equipment and training for the Nigerian intelligence fusion center. And most recently, we’ve worked with Nigeria’s neighbors Cameroon, Chad, and Niger to develop institutional and tactical capabilities that will increase the joint efforts between our countries in order to be more effective. So bottom line, we want to do more. And that was part of my message to both President Jonathan and General Buhari today. We are prepared to do more, but our ability to do more will depend to some degree on the full measure of credibility, accountability, transparency and peacefulness of this election. And one of the principle reasons that President Obama asked me to come here at this moment is to reinforce to all Nigerians the desire of the United States to be able to engage even more so in the effort to push back against Boko Haram or any other violent extremist group, but the quality of the democratic process is important to contributing to our ability to do so. And that’s exactly why I’m here today. MODERATOR: Our last question is from Victor Asije of the News Agency of Nigeria. QUESTION: (Inaudible) and welcome to Nigeria. QUESTION: Are you confident that President Jonathan and General Buhari can be held to their promises – promises they made to you, (inaudible), credible elections, (inaudible) that the U.S. (inaudible)? The other question is this: Now, even after the (inaudible) that the U.S. (inaudible) to discriminate against people from West Africa (inaudible)? SECRETARY KERRY: Can you repeat the last part? The U.S. is likely to discriminate? QUESTION: That the U.S. is likely (inaudible) to discriminate against people from West Africa who are (inaudible)? SECRETARY KERRY: No, I – let me answer that first. I’m personally very proud, and I think every American is very proud, of the extraordinary efforts the United States has made in order to combat the Ebola disease. President Obama made a remarkably courageous and critical decision right up front, when people didn’t know all – publicly, certainly – all of the potential dangers. But when he, by virtue of his briefings and his understanding through his medical advisors, had a strong sense of what was possible, the President committed 4,000 U.S. troops to go to Liberia immediately in order to begin to build the capacity to fight Ebola. We worked extremely closely with our friends and allies, the French and the British particularly, but with many other people – Japan, China. Many countries stepped up as we came together at the United Nations in September, summoned more response, sent people over here, many workers, as you know, who have come back to the United States, and a few of them who came back with Ebola and they were treated, one of whom who died and others who were cured. We have confidence in the ability of people to be cured. We have confidence that this is – that we are gaining in our capacity to control this; we’ve made enormous strides, and I can guarantee you there will be no discrimination against people from anywhere because this is a disease from which people can be determined to be either cured or free in the first place from any infection. As long as protocols are followed, as long as the screenings are taken, I don’t think anybody has to fear any form or any nature of discrimination. I think the efforts of the United States, frankly, speak volumes against that possibility. On the first part of your question about the promises of the two leaders, let me make this clear: I think the real question ought to be will the Nigerian people be able to count on the president, whoever it is? The promises to the people of Nigeria – and to the world really, but principally the people of Nigeria – and I think it’s up to the people of Nigeria to make the judgment about whether they’re confident that any particular person or candidate is going to live up to their word. It’s not up to us to make that judgment. The proof will be in what happens in the days ahead. But I’m here today because President Obama and the American people and the world are looking at Nigeria in this extraordinary exercise of democracy, in this important country in Africa, with the largest democratic election on the continent – and it matters. And that’s why we’re here: to emphasize to everybody, nobody gains by violence. Nobody gains by turning a political disagreement into a killing spree or some other kind of violence. And our hope is that Nigeria will set a remarkable example for the world in this election, and that that will give whoever is President coming out of this election the momentum that he needs in order to be able to define the future that the people of this country so want. And the proof will be in the actions that are taken in the course of the election and afterwards. So thank you all very, very much. Appreciate it.